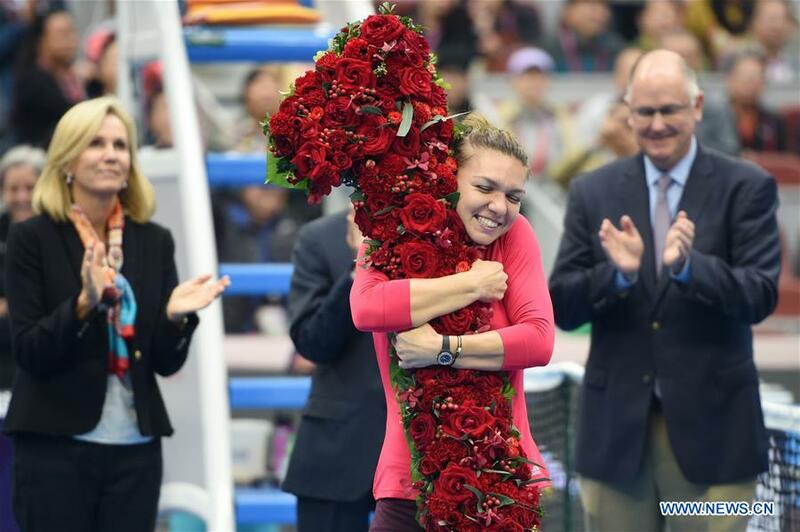 BEIJING, Oct. 7 (Xinhua) -- Simona Halep of Romania beat Latvian Jelena Ostapenko 6-2, 6-4 here on Saturday to reach the 2017 China Open final and will rise to world No.1 for the first time in her career. "It's very emotional, I think it's the first time I cried on court," Halep said on-court after the match. "It's amazing that I could do this. My team, everyone at home...is watching, and I want to thank everyone. It's my special day." Halep broke Ostapenko's serve in the first game at love and expanded the lead to 5-2 with another break in the seventh game beforing serving out the first set. The Romanian held the momentum in the second set to win the last three games of the match to seal a place in the final. "I will never forget this day or this tournament. I always get great support in China, and I'm waiting for tomorrow. The tournament is not finished," Halep added.